Intelligence fields are great resources, giving you additional insight to help you build better professional relationships and make smarter decisions. 30 Days (Events)—Track the number of communications you and/or other users have had with a Contact or an Account in the last 30 days. This includes emails, automatically captured calendar events, as well as events (logged calls/meetings) manually logged in the Stream. 7 Days (Events)—Track the number of communications you and/or other users have had with a Contact or an Account in the last 7 days. This includes emails, automatically captured calendar events, as well as events (logged calls/meetings) manually logged in the Stream. All Time (Events)—This field shows the total number of communications you and/or other users have had with a Contact or an Account. This includes emails, automatically captured calendar events, as well as events (logged calls/meetings) manually logged in the Stream. Author of First Communication—Quickly see which user or customer point of contact authored the first communication. Author of last communication—Can't remember whether or not the ball is in your court? Use this field to display the name of the person who authored the last communication. Days in Current Status—This field displays the number of days since you or other users changed an Account or Contact's status. It indicates whether or not an opportunity is “stuck" at a given stage in your pipeline. First Communication Date—See the date that the first communication initiated by a user or point of contact took place. Inactive (days)—This field calculates how many days it has been since your last communication (emails, calendar events, or logged calls or meetings) with a Contact or Account. Sorting by “Inactive Days" can help you see who might be in danger of slipping through the cracks. Last Communication—This field automatically displays the title of the last email, manually or automatically logged call, or scheduling/rescheduling of a meeting—giving you quick context for your next interaction. Last Comment—This field shows the last comment from the Stream for this Contact or Account. Last Meeting—This field shows the title of the last manually entered or automatically detected meeting—giving you a quick context for your next meeting. Last Meeting Date—This field shows the date of the last manually entered or automatically detected meeting—giving you a quick reminder about your last meeting date. Next Followup Due—View the date of the next Follow-Up you've scheduled—this can be either the next upcoming Follow-Up or the most recent overdue Follow-Up. If you have Follow-Ups scheduled on the same day with multiple points of contact for an Account, this field displays the next immediate Follow-Up. Next Meeting—Curious about what's next on the calendar for a given opportunity? Use this field to automatically display the title of the next manually entered or automatically detected meeting you or other users share with that Contact or Account. Next Meeting Date—This field shows the date of your next manually entered or automatically detected meeting with a Contact or Account, enabling you to plan ahead with one glance. Note: Recurring meetings don't appear in this field. 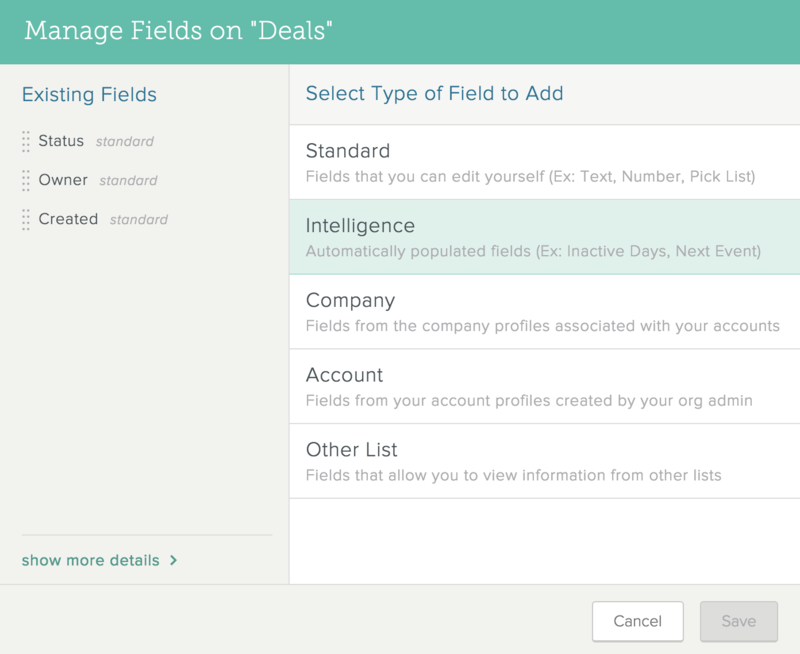 SalesforceIQ has changed the Creator and Created fields from Intelligence Fields to standard fields. If you used the Creator and Created Intelligence Fields before we made this change, they continue to appear as Intelligence Fields. Also, if you created your Organization before the change, you can continue to use the Creator Intelligence Field. After the change, the Created field appears as a standard field in new Lists by default, and you can use the standard Collaborator field to add a List object creator. Learn more.